Dario Balca , CTV Toronto: Toronto Hydro has announced it will launch the world’s first-ever underwater energy storage system in Lake Ontario. The utility has partnered with Hydrostor Inc., a company that specializes in innovative energy storage systems, for a two-year-pilot project intended to create a backup for the city’s electricity grid big enough to power approximately 350 homes. "We're very excited to see this new technology in action,” said Toronto Hydro CEO Anthony Haines. “Toronto Hydro has been very busy exploring new ways to power our grid, and I think this is the most creative project we've been involved in so far. Supporting innovative solutions for Toronto's power needs will continue to be a focus for our organization." 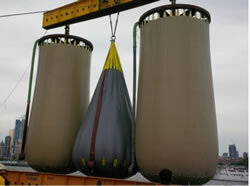 The system works by taking electrical energy and converting it into compressed air so that it can be stored under water in large, balloon-like structures. The storage facility will be located three kilometres off the southern tip of the Toronto Island and 55 metres under water.